There is a wide variety of activities available in Borrego Springs and a mix of environments all within a small area. This is part of what makes Borrego so unique. Below are some tips that can help you plan your trip and enjoy your time in Borrego just a little bit more by being prepared. Being prepared will ensure you get the full enjoyment of each activity in Borrego Springs and stay comfortable. Many of the activities in Borrego Springs are outdoors and center around a fair amount of walking and moving around. Be sure to wear comfortable shoes or have a pair easily accessible at all times. The temperatures in Borrego can vary quite a bit depending on the time of day or night. However, much like any desert environment the swing from the high to low can be in excess of thirty degrees. It is best to layer clothing and bring light clothes that can be easily put on and removed if needed. You may need shorts and a t-shirt during the day and a jacket with long pants at night. While in Borrego Springs you are likely to catch a glimpse of wildlife and nature scenes like you have never seen before. Make sure you have a camera and plenty of film or memory cards available. It is not uncommon to take hundreds of pictures in just a day or two. The air in Borrego is dry so it can sometimes not feel as hot as it really is outside. Therefore, it is a good idea to stay hydrated and drink plenty of water and fluids. Even if you do not think it is very hot be sure to continue drinking fluids. You may want to bring a portable cooler with you. Some of the small portable coolers that fit a six pack are best because they allow you to easily move around on a tour or on the golf course and are not too heavy. It is not uncommon for rooms to get sold out at certain times of year in Borrego Springs. It is a good idea to make plans early and be sure to reserve your room early. You want to start checking for room availability a month or two in advance of your arrival. Even if you enjoy taking adventures in nature by yourself, make it a point to try one of the guided tours available of the Anza-Borrego Desert. The information and sights you will see are truly amazing and well worth the additional time and cost of a group tour. 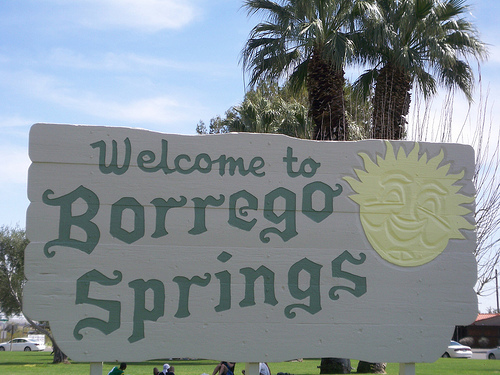 Borrego Springs features a long list of festivals each year. Music, arts, crafts, food and a wide variety of interesting things can be found and enjoyed at these festivals. Try to plan your trip at a time when one of these festivals will be going on and be sure to attend. Borrego might be small but there are many things to do and enjoy. Be sure you plan enough time in Borrego to enjoy all of your activities and do all the things on your list. Keep in mind many of the activities are outdoors and active. So you may also want to schedule a day or two of rest in between events. You probably want to have a small bag or backpack with you that is easy to carry while you adventure around Borrego. This will give you easy access to extra clothing, a camera, extra drinking, comfortable shoes and many of the items we mentioned above.